Microsoft has released the 32-bit (x86) and 64-bit (x64) ISO images for Windows 10 Build 10162, the most updated official preview build of Windows 10 available. Contrary to Microsoft tradition to release a build to Slow ring and ISOs at the same time, the ISO images for build 10162 are published to Windows Insider website ahead of the flight of the build on the Slow ring. 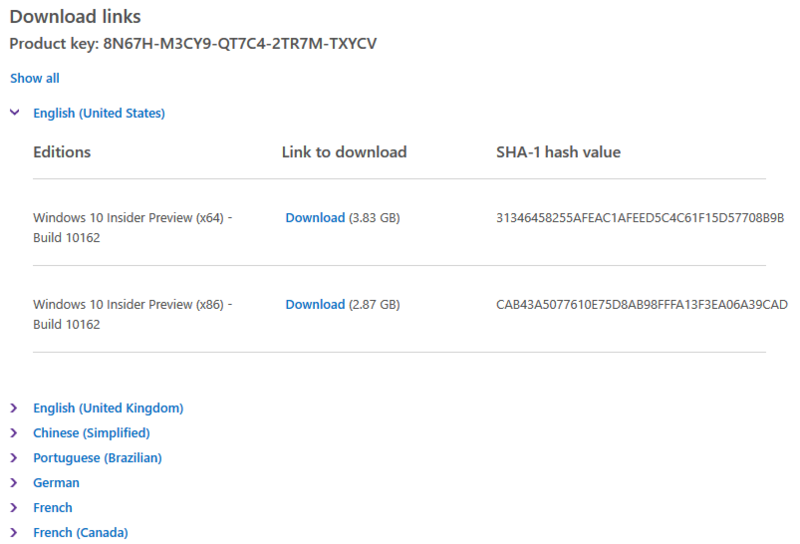 The release is named “Windows 10 Insider Preview ISO July Update”, a true pre-RTM Windows 10 ISO images. As Windows 10 is set to hit the retail shelves on July 29th, 2015, the ISOs may be the second last or third last or even the last set of ISOs released before RTM. Download Windows 10 Build 10162 ISO images from Windows Insider. You may need to register or login to Windows Insider program before downloading. The ISO images allow you to perform clean install or in-place upgrade in case you’re having issue with downloading or installing new preview build via Windows Update.